A summery & light, yet comforting dish. Put olive oil in pan and heat. In a separate pan boil some water and add salt. Pour desired about of rice and double the water and cook for 12 – 13 minutes stirring occasionally until water has been fully absorbed. 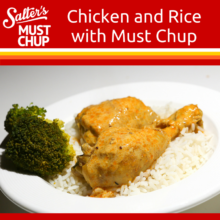 Serve the rice on the plate and place chicken on top of the rice pouring over the creamy Must Chup sauce. Drain the broccoli and serve. Enjoy!